It will probably not come as a surprise that at a time when both Trump, and Saudi Arabia, are pressing OPEC to reverse the 1.5 year long OPEC agreement and pump more oil so US gasoline prices dont soar in the summer months, that according to the just released monthly report from the cartel, total OPEC production rose by 35.4kb/d to 31.869mmb/d mostly thanks to Saudi output rising by 85.5kb/d (according to secondary) sources to 9.987mmb/d and up a whopping 161.4kb/d as per direct communication, and back over 10 million barrels. Joining Saudi Arabia in producing more oil in June were Algeria & Iraq, while production again declined in Venezuela, with Libya and Nigeria also seeing a decline in output. Commenting on the state of the market, OPEC noted that 2018 global oil demand growth forecast unchanged; and is forecast to increase by around 1.65mln bpd to average 98.85mln bpd, with total oil consumption projected to surpass 100mln bpd during Q4 2018. However, OPEC did warn that its outlook for H2 2018 warrants close monitoring of the factors impacting both world oil demand and non-OPEC supply that will shape the outlook of the oil market going forward; the tacit warning here is that oil prices may be so high to pressure oil demand. "Looking at various sources, considerable uncertainty as to world oil demand and non-OPEC supply prevails,” said report read. "This outlook for the second half of 2018 warrants close monitoring." Indeed, according to the report, Saudi April oil demand saw its biggest drop on record, falling across all product categories, with most of the weakness in the heavy part of the barrel, OPEC reported. Demand was down more than 5% y/y in 1st 4 months of 2018, with April falling y/y by 420k b/d, or 17%. In Saudi Arabia, the first four months of 2018 saw a more than 5% y-o-y decline in oil requirements. April was extremely sluggish, with the highest drop ever recorded. Oil requirements weakened by as much as 0.42 mb/d, which translates to more than 17%, y-o-y. All product categories have shown a decline. Most of the weakness occurred in the heavy part of the barrel including the ‘other products’ category. Diesel oil continued its downward trend which started in 1Q16 as government infrastructure projects showed signs of slowing down. Cement deliveries dropped by more than 9% y-o-y, an indication of slower construction activities in the country. Diesel demand dropped by 73k b/d, or 12%, y/y, continuing a downward trend that began in 1Q 2016, "as government infrastructure projects showed signs of slowing." At the same time, gasoline and jet/kerosene consumption both fell by "around 7% y/y" on cuts to subsidies, general slowdown in consumer spending and higher inflation. Mild weather, higher electricity tariffs and substitution by natural gas all hit demand for fuel oil and crude in power generation, OPEC claimed. Meanwhile, shale continues to pump and the cartel warned that non-OPEC oil supply in H2 2018 is anticipated to increase by 2.0mln bpd Y/Y; driven by US, Canada & Brazil. 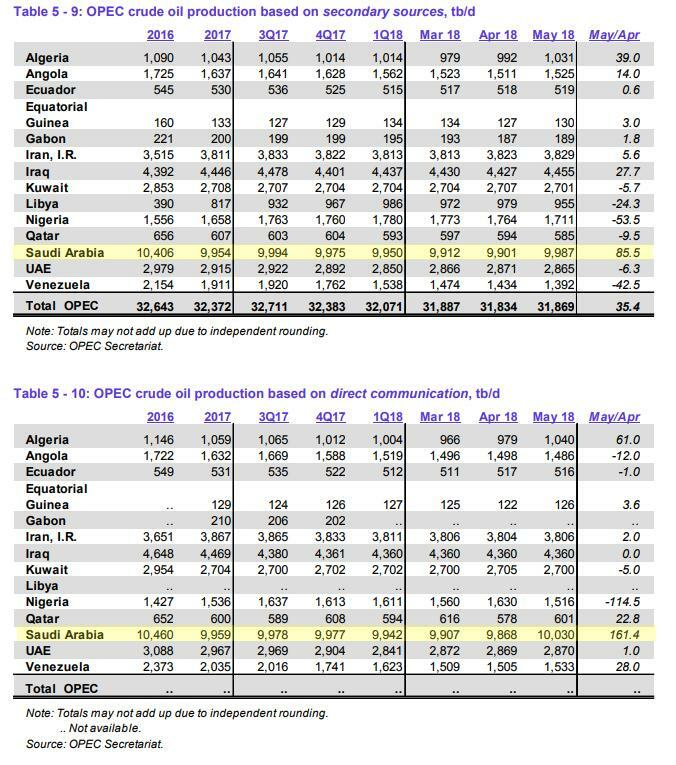 So as we approach the OPEC June 22 meeting, it looks all but certain that OPEC is set to boost production by 500kb/d-1MMb/d to offset the decline in Iranian output. As Citi energy analyst Ed Morse said in a report, an output boost by 4 main producers in the OPEC+ accord “looks inevitable,” with producers most likely to return about half of the 1m b/d they removed from the market, although there is a clear possibility that up to 1MM in production would be increased. After the June meeting, OPEC producers are likely to meet again in September at which point they will decide whether to keep phasing out the production cuts.